2. In order to create an expandable list view, we need three xml layout files. First one is for main listview, 2nd one for list view group item and 3rd one is for list view child item. Open your activity_main.xml and add ExpandableListView element. 3. Create another xml layout for list view group header. I created an xml file named list_group.xml and pasted following code. 4.Create one more xml file named list_item.xml for child list item. This will contain simple TextView element. 5. I am using a custom adapter class to create list view. Create a new class file called ExpandableListAdapter.java and extend this from BaseExpandableListAdapter. This class provides required methods to render listview. 6. Once you are done with customer adapter, open your MainActivity.java and do the following changes. In the following I created required data needed for list view and passed it to custom adapter. Detecting the child item click can be done by implementing setOnChildClickListener listener on listview. You may want to execute some lines of code when the listview group is expanded. For this you can use setOnGroupExpandListener which triggers an event when listview group expanded. Implementing setOnGroupCollapseListener will trigger an event when listview group is collapsed. HI Ravi..i understood this example..How can i add Edittext an Button in childview? yes but..when in the adapter i set the listener it wont listen!!! you know why? Ravi… excellent work… Anyone can make great apps relying on codes presented here. Through people like you we will be increasing the overall quality of android apps. I particularly have a easier learning when altering ready codes and making changes to see the behavior .. Congratulations…. I will click all the sponsors that I can. Hi ravi u r doing a great job. Its very helpful for every one start doing their apps. Try to update daily one concept even it is small also no problem.It will also be helpful for someone..Keep doing. Thanks,But how to anmiate expand and collapse? Any way to animate expanding the list items? As good as always, well done. Hey can u add the code to “auto close the all previous opened list and only opens the currently expandable list “?? wow.. wow wow.. what an excellent tutorial..
but when I run the project it doesn’t show the indicators. Sir ! i wana get record from data base ,how can i? how to start new activity in child data using expandablelist.? back and I will tell you more about the project. Excellent tutorial! Is just what I was looking for, I want to modify a bit your listview, I pretend to put some buttons in the listview or set an onclick event, Could you help me with that? I need to develop a menu for a restaurant and it’s necessary for me that the program counts the clicks on each product. I hope you can help me with this task . First, thank you for a very great tutorial. As a beginner in Android, you have been a great help to me. I am currently trying to make your program into a dynamic expandable listview with data coming from a remote server accessed through PHP and JSON (using your other tutorial as reference). However, I’m having problems trying to save the data on the listDataHeader and listDataChild. Could you please share some tips on how to resolve it? Fantastic dude! Im going to attempt to use this with the Navigation drawer. Hopefully it shouldn’t be too bad. Ravi => Android Sensei !!! 1st thing: great work, thank you so much! 2nd thing: i tried to put a 2nd textview into my childrow.xml but it doesn’t work. i think i’ve made a mistake in the getChildView or in prepareListData… can you (or maybe anybody else) please help me? Hi..how do i apply this on a fragment?? where do i put it?on the onCreate or onActivityCreated? Awesome tutorial..:)..This really helps a lot. hardcoded values into expandablelistview. I want to know how do you get generic database values into it? same error i’m also getting now. Hey, I find it 🙂 you make a class by “ExpandableListAdapter” name. I’ve a small doubt, you actually used same image for all list items. But, how to add diff images for list items. I also get the same error, but finally solved. Nice tutorial thankyou but how do i add a second textview to the childview.I mean adding it is easy (you just have to edit the XML) but i don’t understand how to set the adapter to make text appaer in the second textview. Hey nice tutorial, can you tell me how to add empty views as children of every listview element. So that when i click on an item which does not have children, the application does not crash. Thanks so much, you are a lifesaver! I dont understand what number 3 is, where is it being added exactly? in OnCreate of the Activity that the frag is being created from? How can i take off the arrow on the left (the one that indicates if the list is expanded or not ) .. i created my own arrow on the right that’s why i wanna take off the one on the left !! Do you want to expand and collapse all the items at once ? nope to collapse other groups when a group is clicked. ie expand the clicked and collapse the others. Try this code. It worked for me. But there is one problem when changing the orientation. keep one tab expanded. Now change the orientation of your phone. @ravi8x:disqus : How can i implement Search filter Functionality to Expandable listview. ? Do you implement filter ? error is “The method setAdapter(ListAdapter) in the type ListView is not applicable for the arguments (ExpandableListAdapter)”. What i’m doing wrong? 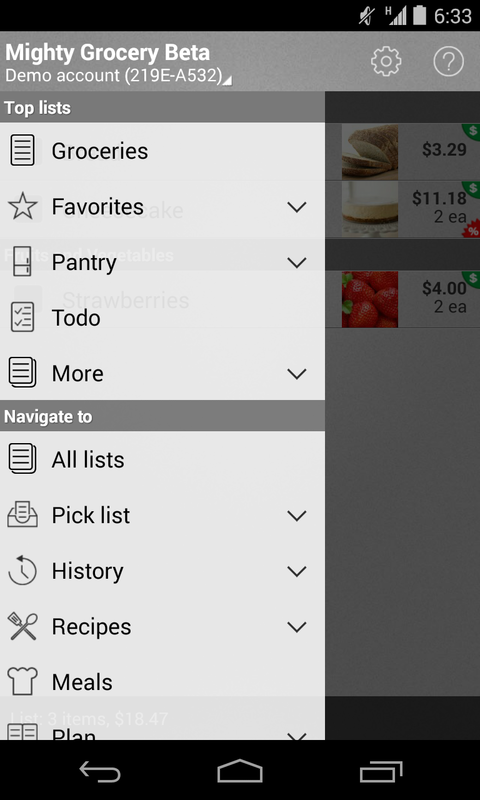 Ok so after taking a good look on this one I was wondering if we could integrate this project on the Drawer navigation. Like for example; we have five default items on the drawer navigation and below that are set of expandable items. Hey Ravi is that possible to integrate this in a Drawer Navigation? I mean both of them are list views right? I want to do expandable listview like tree view.. Thanks a lot, great tutorial. After 2 days of research this tutorial helped me to get what I want finally. Thank you! Again Thanks A lot Ravi………..
How do i insert a radio button in the child item of the list view? Hi Ravi, Thanks for this, how can I put subtitle in the parent header? Great tutorial..How could you add checkboxes to the children? This is great…. Very clear and usefull items, Thanks much for doing this…. I have tried to use a EditText inside ExpandableListView but after adding this Group is not expanding on click. Anyone has any idea about this? Run this in the browser’s dev tools to expand the article’s width. Easier to read code this way. Trying to hide and embed the database primary key behind the values that are being used to populate the children data. Want to create and Edit item page similar to how you did on list view. How do I store and send that? if i want to display a JSONArray, what would be the code? i click on a child and dont get a toast, anyone knows why? WITHIN the “onCreate(…)” method. Then they will run properly (import the proper functions that eclipse says or do a Ctrl+shift+O and it will import the necessary files. But put those 3 listener methods with the toasts functions in the onCreate function. I just want you to know, that after hours of looking for a tutorial on how to do this.. I finally navigated back to you, my default android tutorial man… and my god. Your code is beautiful, it’s explanations are great and its easy to follow. THANK YOU SIR. You are a good writer. Clear and straight to the point tutorials. You should compile all your work into a book. Be blessed. Thanks for this. You are a good programmer and an excellent teacher. Your tutorials are very clean and easy to understand. Has anyone an example of how to implement ExplandableListview retrieving data from a JSON array? I suppose that it will be useful if update this example explaining how to work with dynamic data. Hi, can I do multiline textview for children? i don’t see icon of expand listview? can u tell me how to make auto close of one list when other one is clicked….. Thanks a ton.. It helped me a lot!! Thanks Ravi , your tutorials helped me a lot. One question is that how to expend/collapse list with smooth animation. Hello and thanks for the nice tutorial! I am using this layout for a project and I am experiencing a problem! I have managed to change the background colour of each parent(and child) to transparent but when I click on the parent(or the child) I am getting that yellowish colour(only during the click) which doesn’t match the blue theme of my app. I’ve searched everywhere and cannot find how to change it to transparent as well. Any help would be much appreciated! hi Ravi. I am looking to learn how to use expanable list, for some time and this exampe is the best one, that i can find on net. Can you please help me? for a week i am trying to animate expand and colapse for Expandable list and i done all exept for moment when auto-scroling is activated. when i expand list on bottom off screen, list auto-scroll on bottom of group and it totaly mess my animation. how can i stop that auto-scroll. I alredy tryed android:transcriptMode and setTranscriptMode(0). Please help me i do not have any other way of reseach it more. how can i set images to parents and childs? To add images to either parents or children or both you would have to add an ImageView into their respective xml layout files – list_group.xml for parents, list_item.xml for children. Here don’t forget to use margins to place the image where you need it. You can also place a drawable in the xml thus making all your items have the same images. Alternatively, you could assign image resources to each through code, which might add a little more flavour to your project, but is more involving. how to parse names from json file to expandable list? thanks. I keep getting, “ExpandableListAdapter” is abstract can’t be instantiated. On this line, “listAdapter = new ExpandableListAdapter(this, listDataHeader, listDataChild);” Any solutions? Your Fragment is importing android.widget.ExpandableListAdapter, Remove that. May be Class ExpandableListAdapter is clashing with interface android.widget.ExpandableListAdapter or change the name of the class ExpandableListAdapter to something else. Incorporating this into your project will not be as straight forwards as simply pasting the code into your fragment. You need to create the class, per Ravi’s example. Once you have the class made, you can then add the listeners from his MainActivity into your fragment. Do note because Ravi extends an activity and not a fragment there will be some minor changes that you will have to handle. This is not hard and the errors should clue you in as to what changes have to be made. (Hint: in the listadapter line instead of ‘this’ you will most likely need to replace it with ‘getActivity()’) or something to that effect. Thank you for this wonderful project! It works like a charm! it will allow for one group to collapse as another is clicked to expand! I want to declare two dates like start date and end date in one list view,how to declare? i want a button in group_item.xml class.listview should expand when i press the button not by clicking the listrow.i added my button in xml but dont know how to set clicklistener.kindly help me by writing code….. Thanks buddy…it helped me alot.. Awesome .. super helpful !!!!! Great job. Very helpful to get my exandablelistview up and running. do u think we can have exandable list inside navigation drawer ? Can u do us great favour and learn us how to do it ? Sry if im asking alot . I love Android HIVE. Helped me many times! Keep on this good work. Hey if therre are 10 headings, do we need to create 10 arraylists? Is there any way to avoid this? 1. i add CheckedTextView, to childlistitem. how to make it checked onchildclick? 2. i need to change the header group label when onchildclick? can anyone tell me how to do ? 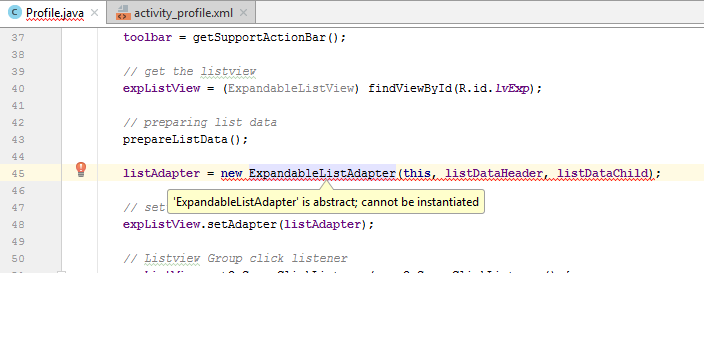 Exactly in ExpandableListAdapter, it says it cannot be instantiate. I’ve already read the comments and I found the solution, now it works good!! Hi thanks for ur code. I need to navigate to another page when child item is clicked. Can any one help me plz?? Same question . Please if you found a solution let me know and vice versa if a found a solution i will tell you . And something is wrong ! Is this what you are thinking of ? the list indicator are not displayed in api 10. How do I solve it? But (there is alway a but 😀 ), I would like to implement a filter only on the Header Datas, but I don’t know how. I tried different code founded on the web, and adapted it to my code, but it didn’t work. Do you have any solutions for this ? I have same problem and don`t find useful issue in internet. Nice Example.. Thanku.. I need show some items (for example 2) on collapse instead hiding all items. What to do? how to use expandable view in sqliet db help me…..
Hai.. Is there any example for sliding menu with expandable view?? how to use this under a single header…. hi wan know is that possible to expand child data ? Is it possible to add children strings from (R.string) or Arrays(R.array) in order to support other languages, instead of using (” “)? 2. Then for each parent item, i add one more element to listChild. But seem it doesn’t work. When i click the parent first time, it works, but the second time it show error: NullPointerException. It’s good tutorial. I have trouble to make arrow icon on ExpandableListview, I have used android:groupIndicator but the image result is too large. Can you tell me how to set height and width it? Use android-9patch and make your image icon stretchable. This helped me . can we do multi-layered expandablelistview with Json response array data.? Why are you mixing fill and match_parent that often? hey hi ,Android hive is a great site.Hats off to writer. How does this work? Doesn’t get() take in an int? where expListView is ExpandableListView and listAdapter is ExpandableListAdapter. This is written in NavigationDrawerFragment which extends Fragment. Consider moving inflator instantiation to constructor and then use parent as 2 argument when calling inflate ie. Hi, what if I wanted to implement the inflate method in the onChildClick? Nice job. Thanks you for your tutorial. so much of thanks to you ..
Is it mandatory that the both child and parent/header list should be equal in size ? Do you mean text size? No. modify list_group.xml, add some sample text, this text gets replaced in the code but you can use the preview panel to see you changes. This is awesome! Just wanted to know how to make it scrollable when my screen has few linear layout along with one explandable list view. I want to make slide menu with expandable list like as flip cart app slide menu.Please guide me. Can you please tell something about the Check boxes in Expandable List View and how to give functionality to them means how to get the checked states of those check boxes and use their values. This is only doubt i am facing 🙁 …. I want to pull my listview items from a JSON feed as in Ravi’s tutorial “android-json-parsing-tutorial” where i would like the heading as the Persons name and on expand the persons info. Can any help about ” Implement Filterable on Child ” for this code ? why cannot resolse symbol ‘R’ ? Other possible solutions include cleaning and then rebuilding your project. Also, try restarting your IDE. Sometimes it can be caused by files getting out of sync with the IDE. USARR, make sure your project or package path is correct. That is where the problem is. Try re-importing the class paths by right-clicking on the “R” code that is give the error and clicking “import”. This should fix the problem. I am trying to get the Child’s position, how can I get it? You have to set the onChildClick listener for the ExpandableList. The attribute called “childPosition” is the one you’re looking for. for this you have to use auto complete text view rather than edit text. when customer start enter your postal code he/she see some list of postal code. you have to match this postal code with your database and retrieve list of restaurant which is in this area. Thanks for the post, this is very nice. But what i have to do if I want to add custom list_item like textview with image. To add an image to your groups, in the list_group.xml file just add the layout that you want that cell to be. In your case you could just add an ImageView next to the TextView. Then, in the getGroupView method add whatever image you like to the ImageView you just added to the xml. Do it the exact same way for adding images to the child views except you will edit the list_item.xml and the getChildView method instead. How can I solve that? Thank you for any help! please anyone guide me how to apply the json in expandable view..
Hi, great tutorial. I would like to implement an animation of expanding and collapsing. How can I achieve that? Thanks for this tutorial this is very simple and nice..
just want to know why im getting error when i remove the child in one of the group..
hello,ravi..my listgroup is not expanding items…y? getting a null error exception from java. Hi, fine and smooth. What if I wanted to inflate a layout once a child is selected? Is that possible to use radioGroup as a child instead of TextViews? Hi whenever I add an header entry with the same name as another header, All the child items will have the values of the first header entry how do I prevent this? 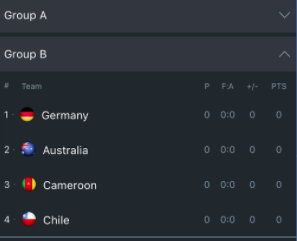 Is it possible to add the default group indicator. My emulator doesn’t show the indicator ? Is it possible to add a html file in the child list. Can you please tell how to implement search feature to this expandable listview ? I have been trying but not successful till now.Please share some tips.Thanks. Hi Can anyone help how to move the icon to the right ? I already tried that…what i wanted was to hide arrows for only non-child groups and not all groups. I used custom png arrows as indicators in the end. But still if theres a solution for using inbuilt indicators, i would like to hear it from you. Thanks. its really a nice example. Thanks for sharing. But if I want to extend the list further for one more hierarchy then what I have to do? 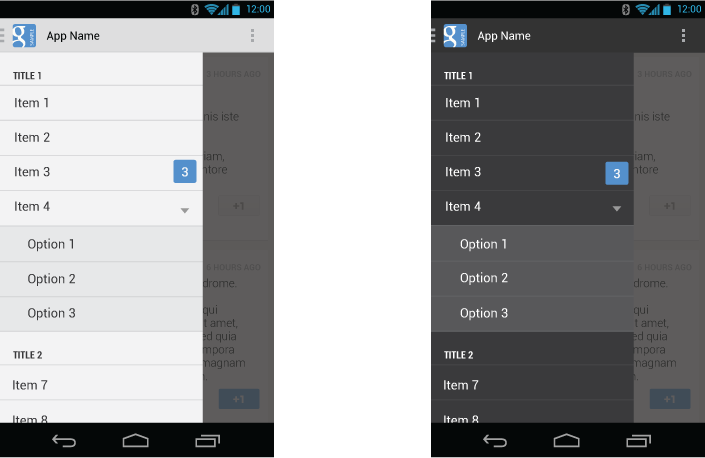 U’re importing ExpandableListAdapater from android. U have to import the custom ExpandableListAdapater that u wrote. how can i remove arrow mark for non Expandable listview. Can someone tell me if it is possible to have several columns in an ExpandableListView? do i need to use notifyDataSetChanged() ? Why? The purpose of adding a checkbox would be to let the user select one or more items. What is the issue your addressing? Thanks. I want to use searchview functionality in expandable listview similar to you . Whenever the user types any term , the group should automatically inflate and highlight the matching child item . Hi All, I extended this sample to support checkboxes in the expandable List View. It was hard to find any samples with checkboxes. Note: You misspelled childPosition in @Override getChild causing an error. Sir these code i am trying. Issue is that when i am using the onclickchild it shows the details in jelly bean version when i am working in kitkat version it is not working. Means i can’t able to scroll to see the list. This style applies,but when I scroll the list, this style also applies to other some of the childrens and works unexpectedly…So please help me with this! You need to write if else. If condition apply your style, else apply the other style. Then the problem solves. list view expanded like animation but on collapse i am using hide visibility. is there any method that on collapse it close like animation.? ExpandableListAdapter class already exists. is there no problems? Hi. i have an error on this one saying it is abstract and cannot be instatiated. what should i do? hi.. can you help me.. i am beginner.. how to create an intent for expendable list view.. im trying add on this code.. however there is an error.. anyone can help me. But now the listDataChild is added as many times as the size of the ArrayList is (9 in the case). May you help me figure it out? Thanks! Hi Ravi – Thanks, this code works like a charm. Appreciate you adding the code for click, collapse and expand group. Can you also add the piece of code for adding an edit text as a means to filter this expandable list view? Thanks. Hello, does anyone know how the expandable listview may be closed on child click? Thank you! Sir .. I want to know seriously how to add data with Myanmar font in Expandable List View.Please help me. how to add buttons for edit or add items? i’d like the add buttons to be on the parentRow then the edit or delete in the childRow. Hello! How can i do to replace the ArrayList with a String  ? I want the second parameter of listDataChild.put(listDataHeader.get(0), top250); to be a String . Hello! How can i change the color of the selected item ? hello ravi, Please make tutorial on expandable RecyclerView. if child is empty. it give an error at size of child. how to rectify the code. In my list some items have child but some is empty. Also how do i make it already expanded if having child. please tell me sir how to resolve this problem….its very urgent for me please help…please!! Can we expand the all groups by default. i want to close other header when selected new one pls help me…. hi ravi,Each child item while clicking went to frgaments is possible? Hi Ravi, How to update child items dynamically on setOnGroupClickListener .? hi did you manage to resolve your problem? would you mind to share what you did because I have the same problem. Thanks! hi thanks for this. I have one doubt how can i add some more field or values in child and header section please help me. Tell Me How To Do That,? Hi Ravi, I have one issue. How to handle the header item click when it is not having any child inside it. hello sir, i am new in android so please help me. I am developing the Basic Activity in which i create the 4 layout file. and One is MainActivity.java file and Second is MyAdapter.java. How to make multiple selection in the childview then? did you found the answer for that? Within ListView i have to use TextView,TextView,ListView.I am not able to work list Within List.Can this Problem be solved Through Expandable ListView???? Hi, great tutorial but I have a question. How can you display just a single item from a child list under corresponding header? So let’s say that in your example you’d for example use listDataChild.put(listDataHeader.get(2), comingSoon.get(2); which obviously doesn’t work because of the ExpandableListAdapter constructor that can’t be changed because then getChildrenCount and getGroup methods from that class won’t work. Any help would be much appreciated. your code is awesome bro…. Please tell me that how can I add items in child on run time in a specific parent using. Scenario is I’m using a spinner in which all parent are saved I select any specific parent the add any thing in textBox and press the Button …… ad it should be shown in that specific parent category. How about having 3 levels. Having a grandparent, with a parent and it’s children? did you find the answer for that? @ravi8x:disqus Great tutorial ! but could you make it if u get JSON data from mysql ? Because there s no ever any tutorial ..all tutorials are static one and manually adding items to expandablelistview ..
Hai did you find out? First and foremost, thank you very much for this. It is very helpful. My question is this. I want to dynamically add the parent and also dynamically add children for each parent. Do you know how to do that? Thanks a lot. It helped me to achieve what I wanted. You rock. Cheers! Thanks Bro 🙂 . I like ur tutorial …. M working on p2p modulation and getting problem on streaming video plz help…. Can anybody explain to my why you need around 5 pages of code, to get a very simple ExpandableListView working? ListView is good to go with just a few lines of XML, why is this so complicated? That is how the exapandable listview is designed. Try achieving the same using RecyclerView as ListView is deprecated. In other words its just badly designed? The visual design part of android studios even has “entries” as the very top field of ExpList, but as far as I can tell, putting anything in there will crash the app. I understand that you need strong java-fu to do the sort of advanced stuff that many developers would like. But having a standard implementation that just populates the list(like with ListView) from XML seems like a no-brainer. ListView works just fine for me, with pure XML. hi ravi ,i have implemented expandable recyclerview but i want childs are also expandable can you please give any idea or code. it’s not scrollable in some roms!!!!!! Maybe try checking the log for the error? I’ve got a problem when scrolling, child were misplaced. Any idea how to solve it? I event try with ViewHolder but no luck. Hi ,i have question. how can i populate expandable list with ready sqlite database? Just read the data from Sqlite and add them to a ArrayList (which is used for adapter) and call notifyDatasetChanged to refresh the list. Could you elaborate more on the subject? This template here is perfect to receive a detailed database and it’s hard to find content about it online. I’ve been searching like crazy and there isn’t good solutions around, so, I can tell you pretty well (I tried Realm, Room Persistence Library and some different kinds of SQLite databases already). For instance, a prepopulated SQLite database with like 10 fields would work pretty well in a ExpandableListView like the one this tutorial explains. Hello Ravi… is it possible using ExpandableListAdapter in RecyclerViewAdapter class ? Hi. Thank you for the tutorial. Can you please guide me as how to dynamically add Group(s) and its respective Item? Hello Ravi your tutorial is really very helpful but, can you please tell me how to change that indicator on click list item.? I got it..how simple it is.!! I have the same question. How to set the icon in the list_group.xml. Unfortunately it isn’t part of your sourcecode. Do i have to set it ‘by-hand’ in the onGroupExpand() and onGroupCollapse() methodes? because i too am writing a blog. I just use device screenshot button combination and use Photoshop to edit them. 2. is it possible to get it in scroll view with banner above it. hello there… am not sure if this has been asked before… how can i add an image under each child? i want to add image for each title of the film. thanks in advance! thanks Ravi, simple tutorial and clean code! Thank you Ravi sir for nice Tutorials. Thank you for the good tutorial. Problem is that if I put the onCreate part into the onCreateView of my fragment, the expandbleListView is just not visible in my app (I tested if the issue would come from the integration of the fragment or the layout by displaying a textView in the fragment, but that worked). I also can’t put the onCreate part into the onCreate method of my fragment, because I then, I can’t initiate my expandableListView. It would help my a lot, if you’d give me some advice! The rest should be fine, because like I said, it works in my MainActivity, but I could send it if you want. Oh my god, that worked. Thank you Ravi 😉 I really appreciate your quick help! can u change the expand buttons and move to right side is it possible? Coudl you tell how to set custom layout inside childView and data binding of image/text in childView? If group has Image like ‘right_arrow’ which we want to change to ‘down_arrow’ when group expands, how to do it? but can you show me how to add event listener to the List elements.that means for example when the “The Shawshank Redemption” list is pressed,it leads to another activity? i use this tutorial and i want when click any child start activity and i do it with some if ,else but i have a problem ! I have a question, It´s possible to have more than 2 hierarchical levels inside of Navigation Drawer? in my opinion you can use nested list view when you have to make a list more expandable… it will slow down the app if data is coming from some servers. Sir,Can you tell me how to create new activities for separate sub items individually ? Thank you for this wonderful tutorial. very useful indeed. How to add multiple columns in the child list? Thank you! nice tutorial but how can you have multiple TextView and bind data when data is conning form JTDS SQL query, will it scroll if all the roots are expanded. Hello, great work. How can I add(put) this listview, into my navigation drawer? _listDataChild might be null. Try initializing it before using it. I followed your tutorial and everything work perfectly. Thanks for such a good tutorial. I’ve just one question how to add lazy loading on every child list after a group is expanded. I want to have a “load more” button at the end of every child list and when I click it, its gonna call API to get 10 more records and I’ll add them under specific child list. please guide me. In this article you can see how to add the load more. Article is very old and uses ListView. prepareListData() how to convert this local data to JSON data. I follow your tutorial too is perfect. I’ve just one question, Please, How Can I check All Checkbox of all Groups ?